Ian Prendergast won all 3 pre-injection races this weekend sharing the podium with Ivan Oxley who claimed 3 2nd places. The third place trophies went to Colin Murphy and Darryl Sharkey over the 3 10 lap races. Prendergast was also on pole position with a 58s lap time. Jamie Lyons was on top of his game all season and this weekend was no different. Nathan McGauran and Scott McCrory kept him honest as they both battled for podiums. There was consistency across the 3 races and the podiums were the same for all with Nathan McGauran bringing home three 2nd places and McCrory three 3rd places. Lyons was also the pole sitter with a time of 1.03. In the Young Guns category, it was between Alex Duncan and Karl Lynch on the Aprilia for the weekend. Duncan won the 3 races but, Karl Lynch closed the gap and was a deserved 2nd place rival. Derek Wilson took a hat trick of wins in the Supertwins classes after some competition. The other trophies went to David Halligan, Jason Cassells and Ross Irwin. David Halligan was 2nd in Race 1 and Jason Cassells was 3rd. An identical podium was formed in Race 2 with Wilson, Halligan and Cassells taking the honours. Wilson and Halligan again took the first two places of Race 3 both Mondello newcomer Ross Irwin, brother of BSB racers Glenn and Andrew, was 3rd. Derek Wilson was also the Pole sitter with as he dipped into the 59’s. Kevin Dempsey took all 3 wins in the Production class to compliment his championship title. In Race 1 Jamie Collins was 2nd from Brendan Glover. In Race 2 it was Shane O’Donovan in 2nd and Mark Quilligan 3rd. Race 3’s podium comprised of Dempsey, John Ward and Jamie Collins. Kevin Dempsey took Pole Position on Saturday with a time of 59.9s. Richie Ryan had the championship title secured but, still turned up to fight for the 3 remaining races. He won all three despite the best efforts of Peter Moloney who collected two 2nd places and a 3rd. Other podiums went Luke Johnston and James Kelly. Richie Ryan was fastest in qualifying with a 54.5 second lap. Keelim Ryan had the use of Frank Doherty’s R1 for the weekend and put it to good use taking 2 wins in the Cup class. Chris Campbell was 2nd in Race 1 and Michael Prendergast was 3rd. Chris Campbell won Race 2 from Ryan and Michael Prendergast in 3rd. In Race 3 Chris Campbell was 2nd and Michael Prendergast 3rd. Gary O’Brien qualified in Pole Position with a 56.5s lap. Emmett O’Grady won the Supersport title with 3rd place in Race 1 which Aaron Wright would go ahead and win from Caolán Irwin. Irwin went one place better to win Race 2 from Keelim Ryan and O’Grady in 3rd. After an error in Race 2, Aaron was back in winning form for Race 3 with another win from O’Grady and Keelim Ryan in 3rd. Aaron Wright also qualified on Pole Position with a 54.5s lap. Keelim Ryan dominated the Cup class with 3 wins. In Race 1 Eoin Collins was 2nd from Kevin Baker. In Race 2 Tyrone’s Michael Owens picked up his first 600 podium from 3rd place Eoin Collins. He repeated the result for Race 3 where John Kavanagh was 3rd. Although Sidecar championship was already sewn up by Dylan Lynch and Mark Gash, still 9 outfits lined up on the grid. Derek Lynch and Anthony McDonnell did the treble over the weekend winning Race 1 from Mark Codd/Liam Gordon and Philip McNally/Dave Butler in 3rd. Codd and Gordon were also 2nd in Race 2 and 3rd place went to Darren O’Dwyer and Ciaran Gordon. Race 3 was a repeat of Race 1 with 1st place going to Lynch\McDonnell, 2nd Mark Codd/Liam Gordon and Philip McNally/Dave Butler in 3rd. Lynch and McDonnell were also quickest in qualifying with a 59.9 lap. Race 1 in the Moto400 class went to Damien Horgan from Alan Smyth and Slane Maguire in 3rd which was enough for Maguire to secure the Championship. Maguire’s celebrations continued with a win in Race 2 from Horgan. Alan Smyth was 3rd. Smyth was the quickest in qualifying however with a lap time of 1.02. In the Classic Superbikes, Chris Campbell won both races from Robin Heathcote on the 750 Yamaha. 3rd place in Race 1 went to Conor Mulally and in Race 2, Cork’s Sean Griffin put his 750 Yamaha on the podium 3rd. Chris Campbell wins the CSBK Championship. Race 1 was won by Shane Connolly from John Cahill and Robert Toner 3rd on the Superbike. 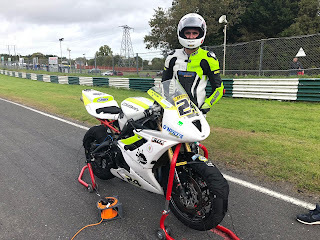 The Supersport Race was won by Dara Crean from James Cottrell and 3rd place went to John Rock. Connolly won Race 2 from Cahill and Noel Carroll. Richard Walsh won the Supersport race from David Kelly. Noel Carroll took the race 3 win from Shane Connolly and Cahill sealed another 3rd place. In the last Supersport race Richard Walsh won again from David Kelly.